One of the points in the framework is "Implementing privacy-enhancing solutions during the design phase of products, when possible." A simple, low tech way to do just this is the use of an RFID shielded badge holder for personal ID cards that are RFID enabled. As many government employees are carrying a PIV, and CAC as their primary form of photo identification, these shielded badge holders protect the person's valuable private data that can be encoded on the card's RFID chip. Read more on protecting your card with RFID shielded secure badge holders here. 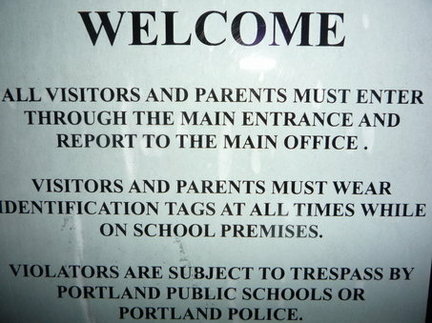 We say - nice job, Portland School District! If districts are not allowed to enforce simple safety procedures, how are they to keep children and staff members safer? Visitor passes are one of the measures to ensure that adults walking the halls of a school are both authorized and cleared to be there. Visitor Pass Solutions (Data Management) sells a complete line of these types of passes, and Laminex is a full-line distributor. See what self-expiring visitor passes might offer your organization. Check out their new online catalog and call Laminex at (800) 438-8850 if we can help you or answer any questions.